Ask fellow campers about "Battle Row Campground" and nearby attractions. This park has been upgraded since the last time(15 yrs)I was here. Newer looking shower house,and playground for kids. Sites are level, nice size,mixed open and shady,mostly shaded. No fire rings I would think due to droughty summer,but folks with fire bowl were flame on. I use an LP faux fire for the fun of it,and no smoke. We camped at Battle Row Campground in a Motorhome. Close proximity to restaurants,supermarkets,or take out. Equidistant to North or South shorepoints and many state parks. 15 minutes to Westbury Music Fair venue. Within an hour of NYC midtown pending traffic. We spent a week here while visiting friends and family on Long Island. It is a rustic campground with very few amenities in a lovely wooded setting. There were many seasonal RVers here, though not having a sewer hook-up must be inconvenient! Our site was asphalt, but we had a very hard time getting our RV level. There is no wifi or cable; very poor TV reception. The restrooms were clean, but there are no laundry facilities. We would probably return for a one-week stay. We camped at Battle Row Campground in a Motorhome. Overall, this is a good choice for anyone wanting to visit NYC, as the train can take you into Manhattan to Penn Station cheaply. There you can access the subway to anywhere in the city. We camped at Battle Row Campground in a Fifth Wheel. If you like hot dogs, there is a vendor who sets up just outside the park that makes awesome dogs. He is there from noon till around 3 weekdays. You can't miss it, as it is a converted TT, red, with Steamin Weenie on the side. If you are interested in history, Old Bethpage Towne is a mile away. This is a very clean, pretty camp & would be perfect & worthy of a 10 rating if they had wifi, sewer hookups & a laundry. It took us several days & finally moving our motor home forward in our space to be able to get reception on our TV satellite. (I don't think many sites here are located in such a way as to get satellite, because of the trees.) There is a laundromat pretty close & they do have a sewer dump. Not a lot of equipment for children to play on so it was mostly adults - nice and quiet. We would stay here again if for a very short time. (It is owned/managed by the county.) So the price paid for a space is a bit high for what you get. We camped at Battle Row Campground in a Motorhome. This is a shocking oasis in a busy part of Long Island. Sites are very wide/spread out, almost level(ish), and rest room/showers are passable. For a county park we were very happily surprised and pleased to have stayed here. Many families appear to stay here quite a while and make the most if it with outdoor furniture, hanging plants and great little patios on their campers. Quiet and relaxed. Nice stop on a long trip. Glad we chose Battle Row. We camped at Battle Row Campground in a Motorhome. This is a nice clean quiet park. Many "permanent" trailers for local weekenders and local workers. Super helpful staff, great air TV and 3G cell service. Close to metro NYC. We will return to visit NYC. We camped at Battle Row Campground in a Motorhome. The campground was clean and quiet. It is centrally located in Nassau county. We didn't realize that there are no ground fires allowed. We would have had to bring our own fire bowl and wood. We will definitely camp here again. It was a positive experience! We camped at Battle Row Campground in a Motorhome. Although out of our normal price range (cheaper if you are a NY resident), we loved it here. It was very peaceful and scenic with a friendly staff, tidy grounds, and easy access and level sites. We would stay here again. We camped at Battle Row Campground in a Motorhome. Wow, I have to come back here. I only needed to stay the night and was pleased that they were open this time of year. 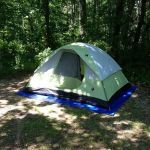 Although I did not see the campground during the day since I was in the area to visit family, it seemed like the kind of place I want to bring the kids. The rates were very reasonable. Before I left the area, I stopped by again to use the dump station. The people were very friendly. We camped at Battle Row Campground in a Motorhome. This park is popular because of its vicinity to JFK (my reason for staying), and Manhattan. It is very busy, but was noisy both nights I was there. The first night, a guy was talking (or shouting) into his phone, outside, after hours. I was about to say something to him when he finally shut it. The second night, I was awakened by someone revving his engine before quiet hours were over. I said something to the office, and she said she "would look into it". The sites are somewhat close and not shaded, so you see (and hear) your neighbor. The ladies restroom was decently clean. I didn't use the shower, but my husband said the mens' shower was horrible - water was everywhere, the curtain did nothing. Because of the price (30$ for electric/water, and 20$ just the site) this place will continue to be busy. We camped at Battle Row Campground in a Motorhome. This is a great, simple campground with lots of shade and wide open spaces. 31 sites are W/E sites for RVs and 21 without W/E. It's located in Old Bethpage on Long Island, about 30 miles from Brooklyn just off the Long Island Expressway (I495). Access to the city is through the LI Railroad (LIRR). The whole island is easily accessible by car, and there are plenty of car rental services around. Getting to the park from Jersey over the Verazzano Narrow's Bridge is not the recommended way to go if you have a big rig. The Brooklyn-Queens Expressway in Brooklyn has a 12 foot height restriction, and all truck and big rig traffic over 12 ft is routed through Brooklyn and not well marked. It's a nightmare drive. Best way to get to the park is to go way around the city, avoiding New York altogether and take the I295 over the Throgs Neck Bridge to the Long Island Expressway. Tent sites are available for less than the W/E spaces. A very nice park for visitors to LI and the city. We definitely plan on returning. We camped at Battle Row Campground in a Fifth Wheel. If you like hot dogs, there is a vendor who sets up just outside the park that makes awesome dogs. He is there from noon till around 3 weekdays. You can't miss it, as it is a converted TT, red, with Steamin Weenie on the side. If you are interested in history, Old Bethpage Towne is a mile away. Are you affiliated with Battle Row Campground ?